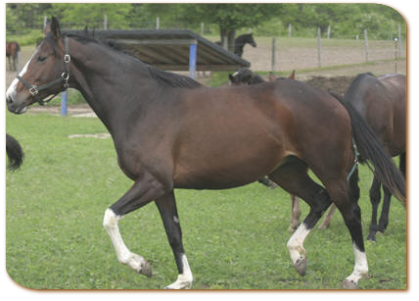 Cinderella's Song is an exceptional 16.1 bay sabino 2005 Thoroughbred mare. She joined us in 2009 and has gone from a horse that was scared of her own shadow to one of the top mares in the group! Her sire Griffinite won over $344,000 and her Grandsire Unbridled has won almost $5,000,000 in his lifetime. This eye catching mare has a home for life with us here and is hopefully as happy living with us as we are with her.